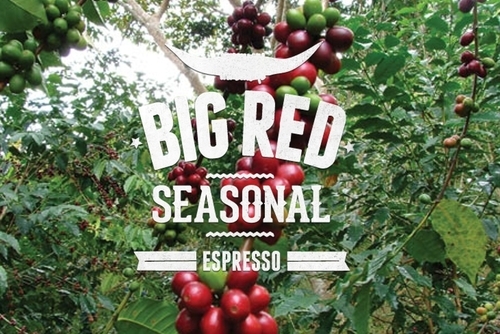 Big Red is seasonally adjusted with fresh harvest single origin coffees currently comprised of two fantastic stand-alone coffees, one from Brazil and the other Ethiopia. Brazil Fazenda Pantano Owned by the Ferrero Family and located in the Cerrado close to the city of Patos de Minas at an altitude of 1,150 meters and covers a total area of 550 hectares. More than 300 hectares of the land are allocated for permanent natural forest reserves. Ethiopian Kebel Konga This fantastic coffee is grown at an altitude of 1,800-2,000 metres above sea level in the Konga Sub Region, Yirgacheffe. The cherries are then delivered to the Kebel Konga Mill where is is graded, sorted, de-pulped and fermented. 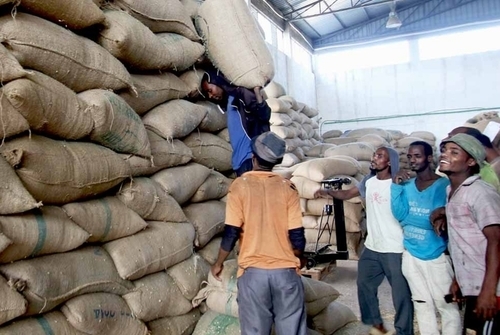 This coffee was sold through the Ethiopian Commodity Exchange system, where it was classified a grade 'A' coffee. 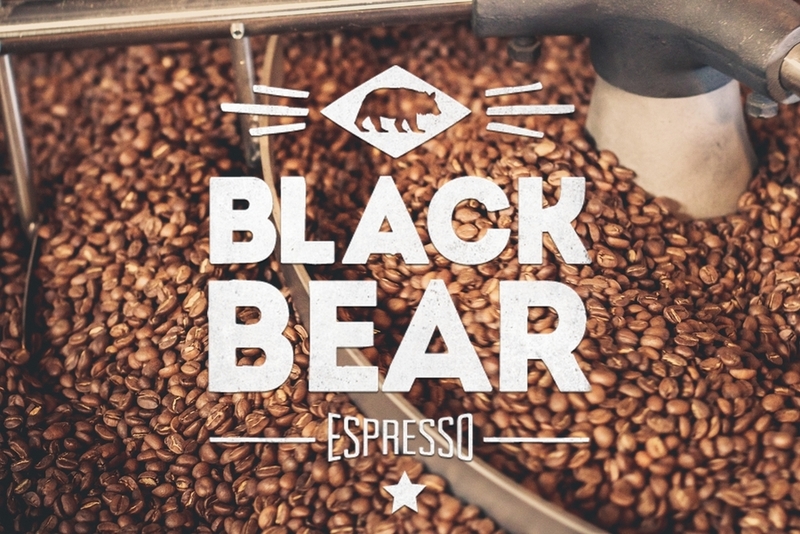 Black Bear, the coffee that started it all....It's our go-to cup and has become our flagship blend for good reason. Our homage to a classic Brazil based blend, comprised from two fantastic stand alone single origins, scoring above 80% on the cupping table. This blend delivers deep, rich chocolate notes and big body. Great for espresso based drinks and is especially chocolatey when milk is added, yet versatile and enjoyable with any brew method. Roasted to a medium/dark enabling full caramelisation bringing out the natural sweetness and body within the cup. Awarded 2 star 'Great Taste Awards' three years running. Our Daily Brew is a fantastic everyday brew. Grown by a group of Colombian farmers within the foothills of the Andes, sharing a co-operative mill, certified Rainforest Alliance. Expect a well balanced coffee with raisin fruit & nutty notes. This coffee will grace any brewing method, from an espresso machine through to the classic french press, a must have for your kitchen stocks. Huila region is located in the southern part of Colombia. 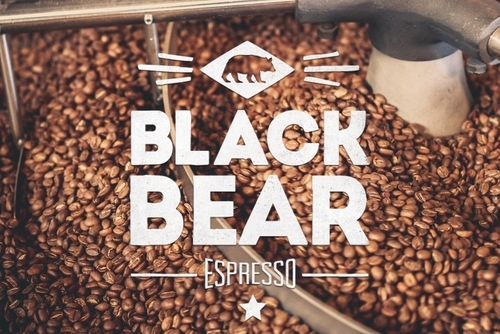 It has all the attributes that are needed to produce an exceptional coffee. Volcanic soils, high altitude, plenty of rainfall and forests that provide shade. 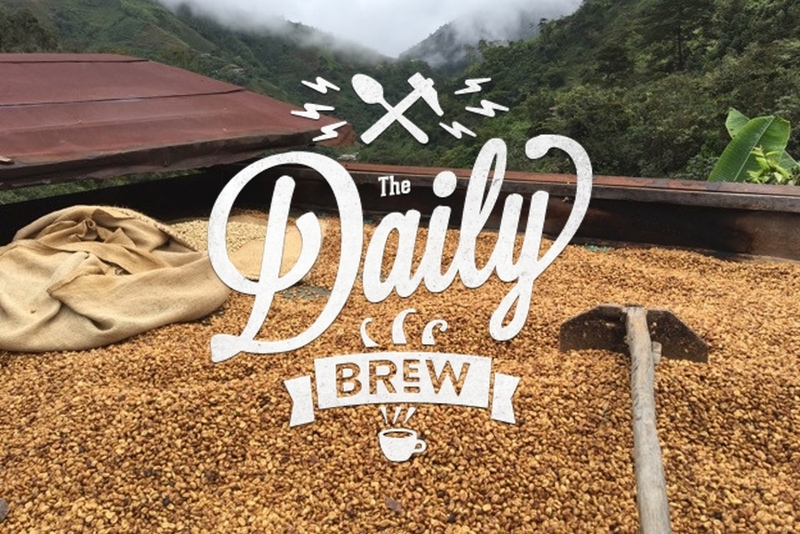 Traditional farming methods are still used to produce this world renowned high quality coffee. 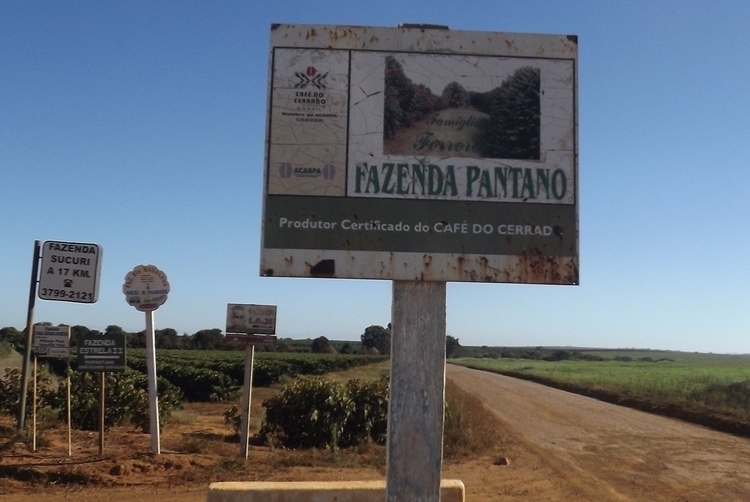 Fazenda Pântano is owned by the Ferrero family and is located in the Cerrado close to the city of Patos de Minas at an altitude of 1,150 meters and covers a total area of 550 hectares. More than 300 hectares of the land are allocated for permanent natural forest reserves, which is six times more than the legal requirement under Brazilian law. The farm has over 200 varietals, most of which are in experimental production, and is working closely with the Brazilian Coffee Research Institute to experiment with processing and flavour. All of these 189 farms had to be audited with only 30 farms going into the final phase, and Fazenda Pantano came out on top! The auditors were assessing three main categories on each farm: food safety, environment and social factors. All processing takes place on the farm and the coffee is only hulled at the point of export and packed into Grain-Pro sacks in order to preserve flavour and freshness. The farm supports a local school and also funds various training schemes and courses for its staff. It is certified by the Rainforest Alliance. Located in the unique volcanic terroir of Poços de Caldas, the Serra Azul Estate sits at altitudes ranging from 1100 - 1200 masl. The farm sits on the periphery of the volcanic caldera (crater) which has a diameter of 31km, lending a terroir and climate perfectly suited to producing specialty coffee with distinct profiles. Sebastião Ovidio started his coffee production in 1979 with his wife Lucilene, where they started with only 3 hectares of coffee plantation. Over this period, they have worked very hard to increase their production quality. The farm itself was established in 1932 when Gustavo Vides Valdes named his property in honour of his daughter. The farm name Bosque Lya translates to Lya’s forest. El Salvador Finca Bosque Lya is situated in the municipality of Santa Ana on the foothills of the Ilamatepec Volcano (or Santa Ana Volcano as it now more commonly known) in the Apaneca Mountain range of western El Salvador. The farm was established in 1932 when Gustavo Vides Valdes named his property in honour of his newly born daughter, Lya. The farm name. 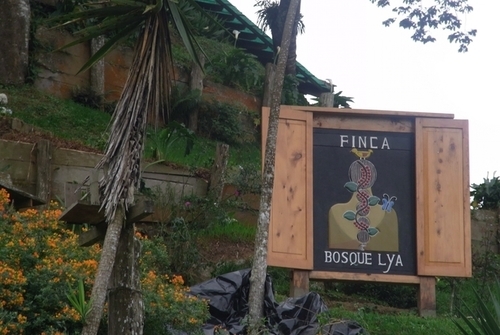 Bosque Lya translates to – Lya’s forest. More detail…. In Central America El Salvador has the nickname, ‘Pulgarcito’, which means little thumb and is of course a reference to the tiny size of this important coffee producing nation. 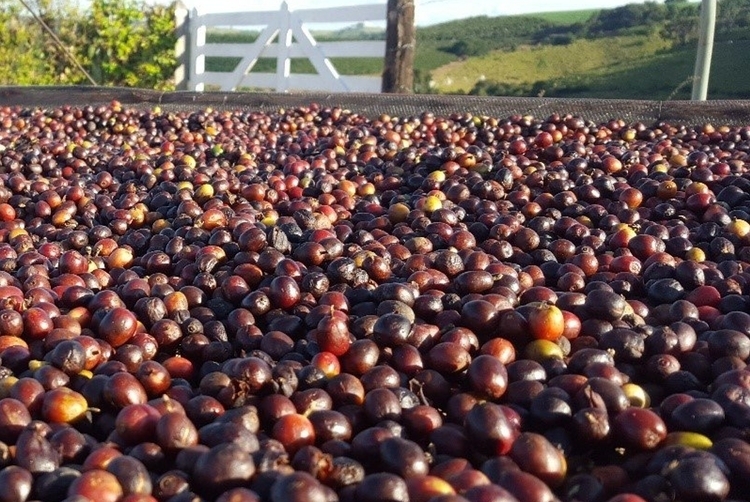 But if the best things come in small parcels then El Salvador is no exception as packed into this little country there are some of the best farms in the whole of Latin America. Many that are capable of scoring very highly on the cupping table. More than half of the nation’s coffee is Bourbon so there is plenty of sweetness, complexity and high acid coffee being produced. Around 90% of the country’s coffee is shade grown, which maintains the rich biodiversity that thrives in rural El Salvador. This is a land of volcanoes, many of them active, so the soil is rich and fertile whilst the views are often strikingly beautiful and always dramatic. Volcan Santa Ana is the largest but Izalco, with its typical conical shape, is a national icon. Such conditions are perfect for the production of high quality coffee. The vast majority of Rwandan coffee is produced by smallholders of which there are thought to be around half a million, with parcels of land often not much larger than just one hectare per family, with an average of approximately 180 trees each. 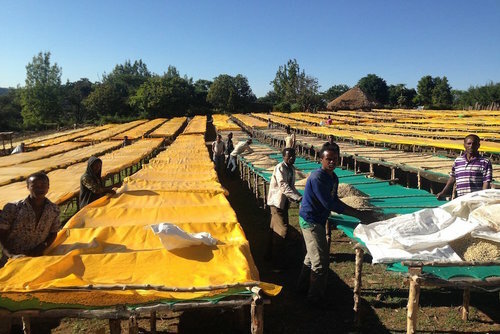 Rwandan smallholders organise themselves into cooperatives and share the services of centralised wet-mills – or washing stations as they are known locally. Located 3 hours from the capital of Kigali, Kegeme coffee washing station is a spectacular mix of hillside and raised washing beds. With recently refurbished infrastructure, Kigeme boosts 40 raised drying beds and counting depending on production. The most attractive part about Kigeme is the high altitude from which the co ee delivered for processing comes from, sitting at 1,900 - 2100m, it allows for farmers to deliver mature, dense, fully ripen cherries. At that altitude coffee matures very slowly which allows for a desirable balance between acidity and sweetness. With a great source of water supply from a nearby river, water is gravity fed directly to the washing station on the slopes.